The existing approach to advocacy training fails to adequately prepare barristers for the physical, emotional and psychological challenges of the courtroom. The remedy lies beyond the confines of the profession. Those in charge must discover the will to open the doors to this noble craft. Twelve years ago, as a then BVC student prosecutor, I inadvertently pointed my pen at the defendant I was cross-examining. (The pen was that breed of Biro that will never write, no matter how much ink it contains; the defendant was my friend Dalton (name altered from Steve to protect identity)). My advocacy tutor, a funny, hyper-intelligent, caring, formidable woman admonished me for lowering my pen too quickly. It was a weapon she said, a subtle means of dominance and intimidation, something akin to a cigarette being brandished in one’s face. I duly raised the pen, spasmodically stabbing it towards Dalton. I didn’t feel dominant or intimidating. I felt awkward, self-conscious and a bit silly. And a little like a slightly unhinged, possibly insane secondary school teacher. But why? I understood the action. I understood the purpose. It sounded like fun. But, and this occurred to me many years later, I didn’t understand how – how to point it, the angle, the tempo, to jab or slowly close in on my mark, aim at the head, heart, gut, groin, or even past him, how to sync my body, face and voice in the action. And what the likely reaction would be to each approach. 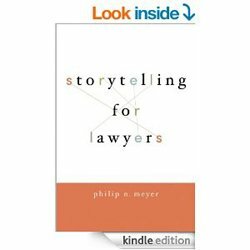 I had unwittingly stumbled in to the realm of performance, something fundamental to a barrister’s ability to establish and communicate his chosen case-narrative to the judge and jury. But, I knew almost nothing of the human mechanics of performance, courtroom or otherwise. Incomplete knowledge had left me uncertain. My tutor had taken me as far as she could, within the time available and the stated aims of the school syllabus. I never took a pen to advocacy small-group again. Of course, we dislike uncertainty and so don’t menace someone with a Biro without a good idea as to the likely effect on them. It may backfire. (They may have a fountain pen). If we lose our nerve, even for a second, we’ll look ridiculous. This uncertainty breeds self-consciousness and hesitancy, which in turn undermines authority, which in turn eats away confidence. Which leads to more uncertainty. How many times does a barrister live out this cycle during his or her first few years, first decade or entire career? How often do they limit themselves in their personal expression, to avoid looking silly or feeling bad? How many advocacy tutors on the three year new practitioner course have been surprised by the conservative approach, the lack of boldness and audacity in their charges, of their unwillingness to truly persuade through the use of personality, psychology and emotion? My innocuous (and quite possibly irritating) tale of a Biro exposes an ongoing deficiency in advocacy training, which relies on the construction of courtroom scenarios, relating to speeches, examination, submissions, through the use of fabricated facts. This approach certainly tunes the student’s mind to the nature of the task at hand. But, it does no more. Theoretically, through subsequent reconstruction and improvisation of this approach on the barrister’s part, and repeated exposure to the courtroom, the novice (I prefer newcomer) should develop her craft. In reality, she doesn’t. And even if she does, it’s more the result of trial and error than leaning on the techniques taught on the BPTC. A system of training that shows the newcomer what to do but not how to do it cannot, and does not, provide a foundational basis upon which lifelong development can be built. The newcomer learns to prep a case and to present it according to the basic principles of advocacy, but not how to bring that presentation to life, through designed, intentional action in the context of a deeper human narrative. He learns advocacy techniques but not the skills required to exploit those techniques, under pressure, in a living, breathing courtroom. No other performance based discipline teaches in this manner, or with such a crude, binary disjunction at the core of its methodology – what to say and do but not how. The difference between a point well made and one lost in the noise is how it is constructed and delivered; the difference between mere information and persuasion. The proper training of an advocate requires an exploration of the deeper, internal mechanics of courtroom advocacy i.e. that which is of paramount importance to the feeling of comfort and control in court. Instead, a systemic failure to prime barristers for their subjective courtroom experience leaves the newcomer with no measurable means by which he can, without unnecessary and potentially fruitless trial and error, manage psycho-emotional relationships with the judge, a witness, opponent or client; control his mind, voice, speech, breath, emotions and body language under pressure; detect and manipulate the strategic, often hidden exchanges that form the subtext of a trial, conference or negotiation; or deploy the full force of his personality in pursuit of victory. The standard approach to resolving the issues identified above is that trial and error will do its work, over twenty years or so. Firstly, that’s a fifth of a century. Secondly, when knowledge of performance is acquired or accumulated trial and error, often subconsciously, absent any solid foundation or principles upon which it can rest, recall of that knowledge under pressure (or indeed the ability to pass it on in a systematic, deconstructed manner) becomes haphazard and inaccurate. Generalisations and aphorisms are liable take root; do’ s and don’ts, which the newcomer’s mind interprets simply as ‘don’t – stay safe’. In taking a magnifying glass to the building blocks of that existence, the newcomer learns to self-measure, self-analyse and self-correct her development. She effectively creates her own feedback loop and is no longer reacting to, but controlling, her experience. As she does so, she unlocks the key to controlling the experience of others. At a time when the Bar is under routine, almost fetishistic attack, the greatest gift to those entering practice would be for their educators to insist they are adequately prepared to meet the extreme psycho-emotional and physical pressures of court life. Until the newcomer understands how, why and when these pressures become active, he will remain at their mercy. A command of the facts, which questions to ask, when to ask them, these are the lifelong preoccupations of the diligent barrister. The inexperienced barrister nurtures additional concerns that ultimately relate to the quality of their performance and whether they are good enough. Inherent in these concerns is the wish to be free of nerves, of doubt, reactive-ego, stress, tension and self-consciousness. The resolution of these anxieties is left to trial and error. Why? Chan Shoker spent six years at Cornwall Street Chambers, before retraining as an actor.